I had great plans for Friday. 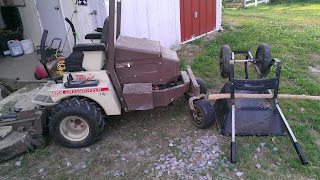 I was going to mow grass and move hay in addition to capturing the horses for farrier day (equine pedicure) Saturday. There was a wrench in those plans though. First my grandma was in a minor car accident and I had to sit in the emergency room while the doctor told her she had whiplash. Then when I finally got home to mow I found a flat on the lawn mower. Initially I aired it up and had about fifteen or twenty minutes of mowing without problem. Then it went flat. Then it wouldn’t air up when I drove the compressor down to it on the four wheeler. Then the four wheeler wouldn’t start. This brings me to today’s blog, Problem Solving with Lauren. With a long enough lever man can move the world. Or a lawn mower. Take that Murphy. You know where you can shove your stupid law!